Turmeric tea brewed from plain water and turmeric spice provides potent benefits. Turmeric may prevent Alzheimer's disease, fight cancer, and improve bone health. Many cultures believe that turmeric tea also battles depression too. With a bit of added ginger and honey, turmeric tea adds a pungent, tasty healing tea to the herbal medicine chest. Turmeric is a bright golden-yellow spice that hails from India and Asian countries. It's a staple of Indian cuisine and is added to curries and rice dishes. It's also added to condiments such as mustard to give it the characteristic golden color. Turmeric adds a spicy zing and bright color to many culinary dishes. For most people not used to curries and heavily spiced dishes, eating enough turmeric to achieve health benefits may be tough. That's where turmeric tea comes in handy. 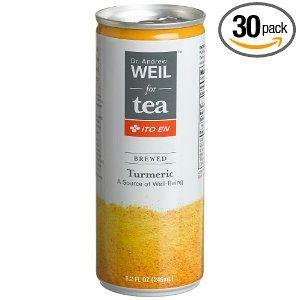 You can brew a cup of turmeric tea using spices found at any grocery store and obtain the same health benefits as those who eat turmeric regularly. Drink one cup a day to start, and use the least amount of turmeric. Over time, as your taste buds acclimate to the spice, add more. Mix the water and turmeric together in a pot and bring it to a gentle simmer. Simmer for 10 minutes. Add spices such as cinnamon or a few cloves to taste. Strain the mixture, reserving the liquid. Sweeten with honey and almond milk, again to taste. Sip. That's it! The health benefits of turmeric, including teas made with turmeric, are well documented. Dr. Andrew Weil, M.D., states on his website that studies conducted at the University of California at Los Angeles that rats fed curcumin, the active ingredient in turmeric, blocked the accumulation of beta-amyloid plaque in the brain, the hallmark of Alzheimer's disease. The National Center for Alternative and Complimentary Medicine presents the results of a study using curcurmin to treat rheumatoid arthritis. Dr. Janet Funke, M.D., at the University of Arizona, fed rats with different amounts of turmeric and curcumin extract before the onset of rheumatoid arthritis and after. The results suggested that turmeric, rather than an extract, had a more beneficial effect in reducing inflammation. The rats who ate turmeric prior to the onset of inflammation also fared better than rats given the turmeric after the onset of inflammation. As with any herb, there are some people who should not use turmeric. Pregnant and nursing women should avoid turmeric tea. Turmeric may cause an upset stomach, especially if you aren't used to it, so begin your turmeric tea regimen with the lowest dose possible and work your way up to more if you would like to take more. People with diabetes and hypoglycemia, as well as anyone taking medications that can affect blood glucose levels should not take turmeric. Turmeric may prevent clotting, so if you are taking drugs that change the rate at which your blood clots, avoid turmeric. As with all herbs and natural preparations, tell your doctor you are taking them. Ask you doctor's advice about specific diseases, conditions, and drug interactions that are possible with this herb.